Either a Chinese Cabbage or Pac Choi - still smaller in size, but we need to start harvesting some each week before there are too many ready all at once. One thing that is interesting about running a CSA farm is the notion that we hope to be able to harvest a certain amount of each crop for every farm member each week. Most times this works without a problem. We harvest the radishes, count how many were picked, and divide that number by how many shares we are putting togehter. This method doesn't work with individual crops like pac choi or cabbages. Though they were transplanted at the same time, some are ready to harvest now while others are a week or two behind. Sometimes there are only half of what we need to give one to everyone. So, we shuffle our plans around a little. Giving one crop to members picking up at one location and something else to another group. I try to keep track of who got what and reverse it the following week. You should see us tyring to put all the shares together. OY! At least it helps me practice my math skills. Shain is in Spring Salad Mode. He's made fancy salads for us several days this week. I've also converted him to my love of egg salad & arugula sandwhiches. This Arugula & Pear Salad was lunch at our home yesterday. 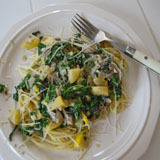 It's a Rachel Ray recipe and I've added it to our recipe website. Very yummy. The mizuna is growing like crazy. We decided to harvest the larger leaves this week and give it as a separate item in your share this week. Although we grow mizuna as a green to go in our spring salad mix, there are many ways it can be prepared by itself or in recipes. We did this last year and received postitive feedback from those who come help at the farm. Let us know what you think. Did you like getting a bag of this spicy green on it's own? Or did it go to waste? Thanks. We've woken up two days in a row with about two inches of snow on the ground. It's been a wet and soggy couple of weeks on the farm. With the few dry days, Shain has taken every opportunity to work our fields and get in some plantings of a varitey of crops: salad mix, spinach, herbs, peas, scallions and leeks. Meanwhile, we've been doing a lot of work inside the greenhouses. We love our greenhouses this time of year. We have 6 greenhouses in total now, equalling a combined 13,500 square feet of covered (and dry) planting space. This is the inside of greenhouse #1. Planted from left to right with pac choi, cabbage, Chinese cabbage, our second planting of Japanese turnips, and two triple rows of arugula (which I harvested from this morning). The Chinese cabbage is getting close to being ready to harvest. The pac choi will follow soon after that. The third cabbage we are growing is a new variety for us and growing more slowly. Greenhouse #2 is where we've been taking all our salad greens from. You can even see some of the area Shain cut from this morning towards the left in this picture. From left to right: mizzuna (which continues to grow like crazy), two quardrouple rows of salad mix (3 varieites in these rows), Japanese turnips, radishes and our first planting of arugula (which we've already harvested completely over the past two weeks). We are hoping to get another week or two out of this salad crop. When greenhouse #1 & #2 are "done" we will rework the soil and plant them both with fillet beans. This is a picture from inside greenhouse #5, aka "the big tomato greenhouse". Because this is our warmest and most air tight greenhouse, this is where we keep many of our seed flats. The seedlings currently growing here are basil, romaine head lettuce, oregano, dill, cauliflower, and our leftover "back up" tomato and cumcumber starts. In the middle are three long rows of newly transplanted tomatoes, interplanted with basil. To the far right are the cucumbers. The center row under the bunched up white row cover is where we will plant our peppers. Those who are new to our farm blog may wonder "what are those plant cover things" and why we use them. The "covers" are recycled pop, juice and water bottles which we've cut the tops and bottoms off of to place around each precious tomato and cucumber plant. Many people think we do this to protect the plants from the cold, but actually we are protecting the plants from hungry rodents. A few years ago we lost about 30 tomato plants to the little devils. We came up with this solution and it has been working well for us ever since. I've posted a picture from inside greenhouse #6 recently. This is where we are growing carrots, onions and beets (left to right). I think it's amazing to see this much growth in just two short weeks, especially when there has been such little sunshine. I swear I saw an inch of growth or more on the onion plants the day after they were watered. We still have a rack of seed flats growing inside our home. The zucchini, squach, pepper and melon plants need warmer conditions to germinate and sprout. The squash seedlings came up just a few days ago. On this rainy day, they are reaching for any chance of sun that could possibly shine through our southern facing windows. Remember these little ones? They are two weeks old now and so CUTE! For the record, I did not stage this picture. Amazingly, all three jumped up on the log and stood there looking at me. By chance, I was ready with my camera. Baby animals are a lot of work, but they also bring a lot of smiles. We are having fun with them and I'm glad to say they are healthy and well. Plenty of other things going on behind the scenes here. We'll start planting potatoes this week and hopefully the cauliflower too. The weather forecast says sunny warmer days are on the way. Our college daughter comes home for the summer this coming weekend. This family farm is one of her jobs for the summer. (We hope someday she'll appreciate the opportunity she has to work here with us.) Shain is through teaching school for the summer and I'm glad to have him home helping me again. Life is good. Bring on the sun. Please remember to remove the greens from your radishes for storage. Even after being harvested, the leafy green tops of root crops will continue to draw moisture from it's root (the edible radish, carrot, beet, turnip, etc.) leaving that portion limp, dehydrated, and otherwise less desirable to eat. We are continuing to give a super sized portion of salad while we can. The salad grew in really well and has taken off (almost too well). So, enjoy the salad now while it's so plentiful. There will come a time later in the season when salad is harder to grow or becomes the main attraction for bugs. I am enjoying one of my favorite ways to eat arugula - on an egg salad sandwhich with sour dough bread. Oh my. Love it. We hope to harvest Japanese Turnips for next week. They are also one of my favorites and make a great sandwhich. Arugula is a definate favorite of mine. Unfortunatley, it is only an early season crop for our farm. As soon as it's warm enough for the flea beetles to come out, they will attack our precious arugula with a vengence. They love it too. Many of us know about arugula by now. It may be new to some of you because it is not readily available at the grocery store, probably because it has a shorter shelf life than many greens. We love to eat it alone as a salad, mixed in with the other salad greens, on a sandwhich, or to make pesto. We have a few recipes on this website too (click the link on the left). Our cabbages and pac choi are really starting to grow. The radishes and Japanese turnips too. It should be only a few more weeks before they are ready to harvest for your shares. I'm keeping my weekly newsletters short and focussed on what you are receiving each week in your shares. For more information about what is going on here at the farm, please read my farm updates which I post randomly throughout the week (with pictures even). Seeing the new garlic popping up through the mulch this year makes us so happy! We have high hopes for this garlic crop. Our experience with the garlic last year was upsetting. First, most of the crop grew very poorly. It was stunted (smaller than normal) and "ugly" (odd coloring, strange markings) and some of it literally rotted in the ground. We eventually figured out that our garlic crop (all three varities) had succommed to a virus (most likely due to stressfull weather conditions over the past few years). The bulbs were edible, but we could not use our own stock to replant in the fall. Second, we had quite the ordeal finding and purchasing new garlic to replace our infected stock. We found a local grower with beautiful garlic, but he would not sell to us because he sees us as "competition". Finally I found a good on-line supplier with a decent price for garlic. We ordered a lot! (We were choking on the price tag but considered it a vital investment.) We wanted to have enough garlic stock to plant so that the following year (2011) we could give it to our CSA members, sell some at the market, and then have plenty to plant again in the fall. When it came time to receive the order, we received bad news from our supplier (a garlic grower back east) that he could not fill our complete order. He was cutting us back to only 40% of what we needed. Not good! Next, we quickly searched around for another source of high quality garlic stock and learned that many garlic growers across the nation were experiencing crop shortages, even failures like ours. The only sources we could order from were charging very prices which we could not justify spending. At this point we came to a difficult realization. The garlic we had purchased would not be enough. If we planted all of it in the fall, and replanted that entire crop again the next fall, we could be back up to our previous garlic crop levels by 2012. 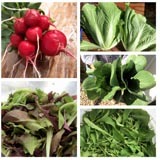 But for 2011, we would not have any extra for the CSA or to sell. Last fall we planted our beautiful newly purchased garic stock. It was a little on the small side (really nice BIG garlic costs $$$). But we got it planted just fine and Shain even roped off the area with stakes and brighly colored tape to make sure nothing bothered our precious efforts. Then about a week later a cow got loose in our fields and proceeded to run through the garlic patch. Thankfully, a helpful neighbor came to my rescue (Shain was already back to teaching school by then) and the overall damage was kept to a minimum. Throughout the winter we've though about the garlic. We've wondered how it was doing under ALL that snow! Many times we expressed our relief that we got that layer of mulch spread in the nick of time. When spring came and the garlic was still under snow, we were a little worried that it would make it. Then the snow melted and we could see tiny shoots of green poking through the rows of dried hay. Seeing that new garlic growing (after all we've been through) really makes us both very happy! We are on our way back to having a great garlic crop again someday. In summarizing our farm activities of the past week, three things come to my mind. 1. We got a lot of weeding done! By Friday late afternoon, all of our planted greenhouses were caught up on weeding. This is greenhouse #6: carrots on the left, onions down the center, and beets on the right. This is about 1,000 square feet to weed. Because these plants are so small and the spacing is tight, this greenhouse was mostly weeded on our hands and knees. But I used my new favorite hand-held hoe so it wasn't so bad. 2. We also got a lot more planting done this week. We transplanted the Swiss chard and more onions. Shain started the zucchini and summer squash in seed flats which are being kept warm inside the house for a while longer. He also planted cilantro, parsley, scallions, leeks, and snap peas out in fields #3 & 4. 3. On friday, May 13th, our goat Daisy delivered her babies. Triplets! These two pictures were taken just a few hours before she delivered. She was HUGE! Poor girl. I'll spare you the details of the long and semi-complicated delivery and skip right to the baby goat pictures. Our son Eli is doing a good job helping Daisy take care of the little ones. They are SO VERY cute! At this time of the year, one of the varities we grow for the salad mix is an Asain green called mizuna. The leaves are darker green leaf with serrated edges. The flavor is slightly spicy and it adds a nice kick to the salad. Unfortunately, mizuna is a favorite of a few bugs that come out when the weather gets warmer so it will only be in your mix for about a month. Then we'll switch to growing other salad varities that do better in the heat. Just to let you know, all our salad greens are thoroughly washed before they are packaged. The bags we use are specially made to preserve freshness. I've had salad stay fresh in these bags for up to two weeks! Crops are off to a slow start. There is much planted and growing. It's just growing slowly due to cold weather and lack of sunshine. I'm hoping the arugula will be ready next week. But for sure we will have another large bag of salad mix. Take Care and Enjoy your Greens! The frame for our newest greenhouse (we now call it greenhouse #3) went up last fall. Putting it's cover on this Spring has been quite an adventure. It is a new style of greenhouse for us and is called a single bay high tunnel. There are several differences between this structure and our other 5 greenhouses. First, the size is a lot bigger. It covers about the same lenghth of ground as greenhouses #1 & #2 put together, as you can see in the photo below (greenhouses #1 & #2 are to the right/south). This one measures 154 feet long by 30 feet wide. That's 4,620 square feet of greenhouse growing space! The design for this greenhouse is for the plastic covering to come down over the winter. The spacing of the metal trusses are furhter apart and they not intended to support the weight of heavy snow piling up on a covered top. Also, the plastic sides are not anchored down to a baseboard, rather they are held in place by a criss-crossing of ropes which are tethered at the base of each metal frame. These two changes alone cut the construction and material costs down considerably. The manfacturer's instuctions for attaching the ends of the large plastic covering to the metal framing is to use their provided clips. This is how we assembled it the first time back a few weeks ago. It was a beautiful sunny day. We had a crew of great helpers here and the entire process went without a hitch. The greehouse was covered and roped down in about an hour and a half. We were really excited! Then just a few days later a large snow storm came in and literally blew off the cover! I was home alone and was quite surprised to look out the window and see the east section of plastic flapping violently high up in the air, the middle area ballooned like a parachute, and the west end still anchored in place but not for long. The clips we used to hold down the plastc on the east end were no match for the force of the wind which was very easily entering at the open space along the ground. Once inside, the gusts had no where to escape. I called my neighbor to come help. We unclipped the rest of the covering, pulled everything down to the muddy, snow covered grond, and did our best to roll up the plastic so it wouldn't go anywhere. After several phone calls and a lot of research, we came up with a new plan using a more permanent anchor system along the tops of the metal framing on both ends. The folowing Saturday, April 30th, we gathered a crew of workers again to recover greenhouse #3. The plan was to wait long enough into the day for the snow to melt and the ground to dry a little. Unfortunatley we waited too long because the wind kicked up again and we had no choice but to conceed ourselves to it's power. As I think back on it now, it is amusing to recall how we fought so hard with ropes and our body wieght to keep a sheet of plastic anchored in place. It was all over the place. WE were all over the place. We left the plastic there on the ground again in hopes of a better day. The next morning Shain walked outside to do our morning work routine and declared the weather to be perfect for another try! He made a few phone calls, we did our chores in record time, and within 30 minutes there were enough people here to make our third attempt at covering greenhouse #3. The process went as smoothly as our first try, this time using our modifications. Shain also cut a small opening along the top of both ends to allow the wind to escape. So far, so good. It's been tested with a few more wind/snow/rain storms and stayed on just fine! The area underneath has already been planted with Swiss chard, carrots, and beets. There is still plenty of room for more cabbages, pac choi, broccoli and cauliflower. Shain gave the go ahead today for our first CSA delivery. I'm putting all the details in place and will be contacting all our CSA members very soon. The only produce that is ready to harvest right now is our salad mix. We've been going back and forth for several days in our decision to harvest the salad when it's just right or wait another week when there will be an additional item to include with the CSA share. From all the people I've spoken to today, no one is complaining. We all want salad! Shain is outside planting more crops even now as I write this blog post. We are working every day to bring you a bounty of food this season. There are so many crops planted and growing right now that it's hard for me to remember it all. I've noticed an increase in the plant's growth over the past week as the temperatures have warmed up a little and the sun is out more. It will all kick in soon.